Contraband gold pieces in rectangular form, weighing around 3.6 kg and valued around Rs 1.06 crore, were seized from suspected smugglers in Manipur, informed customs officials in Imphal. 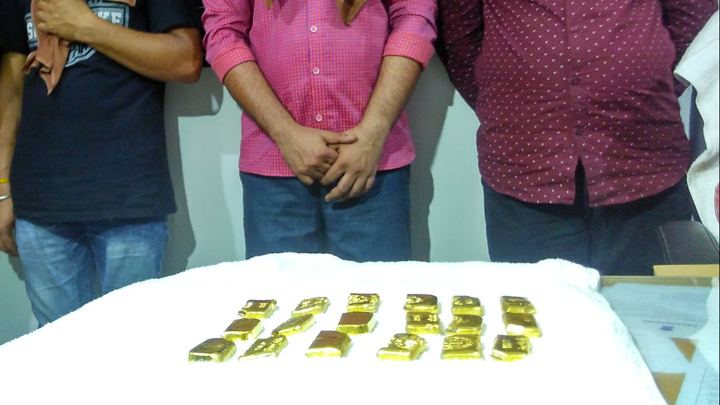 “Four persons, who were travelling to Dimapur in Nagaland in a passenger vehicle (Tata Winger), were arrested from Koirengei Bazar along the Imphal-Dimapur Highway around 4 pm on Friday for allegedly trying to smuggle 16 gold pieces in rectangular form with a marking which read ‘Fine gold 999.9’ worth Rs 94.55 lakh from their shoes and stroller bags,” said Ningombam Meiraba, Superintendent of the Imphal Customs Division’s anti-smuggling unit while speaking to reporters on Saturday. The gold pieces weighing 3206.2 grams appeared to be of “foreign origin” supposed to be smuggled from Imphal to Dimapur and further to Mumbai by train, he said. The four persons have been identified as Sanjay Kumar Krishnani (32), Jayram Parbati Manglani (40), Harish Nanikram Shringi (44), all from Ulhasnagar in Thane district of Maharashtra and Umesh Laxmandas Darda (32) from Aurangabad in Maharashtra. At the same time, officials of the customs also seized 2 gold pieces in rectangular form with a marking which read ‘Fine gold 999.9’ weighing 399.9 grams valued at Rs 11.79 lakh from one suspected smuggler from North AOC area in Imphal. One Dilip Rajkumar Laljani (29) also from Ulhasnagar in Thane district of Maharashtra was arrested in this regard. The customs official informed that the collective weight of the seized items came up to 3606.1 grams valued at Rs 1,06,34,389, adding that the cases have been registered for necessary steps. So far, the Imphal Customs Division’s anti-smuggling unit has seized Rs 8 crore worth contraband gold weighing around 30 kilograms and booked 22 individuals under 21 cases since April 1,2018. Besides, the unit also seized 1 lakh WY Amphetamine tablets worth around Rs 3.05 crore in the international market from the possession of four persons during the period. On March 9, 12 Assam Rifles personnel seized 97 gold bars amounting to Rs 4.8 crore from a Maruti van that was plying from Moreh in Tengnoupal district to the state capital.